On April 8, Officer Chris Bovert noticed a man lying on some rocks near 16th Street and Southern after he fell out of his wheelchair. According to Phoenix police, Officer Bovert rushed over to help. After seeing a man lying on some rocks, Officer Chris Bovert stopped to lend a hand. PHOENIX — To protect and serve. That mantra was on full display in Phoenix recently as an officer stopped to help a man in need. On April 8, Officer Chris Bovert noticed a man lying on some rocks near 16th Street and Southern Avenue after he fell out of his wheelchair. According to Phoenix police, Officer Bovert rushed over to help. Alyssa Campa's sister was nearby and captured a photo of the heartwarming act of kindness. Police said with the help of another bystander, the pair helped the man back into his wheelchair. Bovert then noticed he had some minor wounds and asked the fire department to stop by to evaluate the man and treat his abrasions. "This kind and compassionate approach occurs many many times each and every day from men and women in this profession who have dedicated their life to serving others," wrote Silent Witness Sergeant Jamie Rothschild. 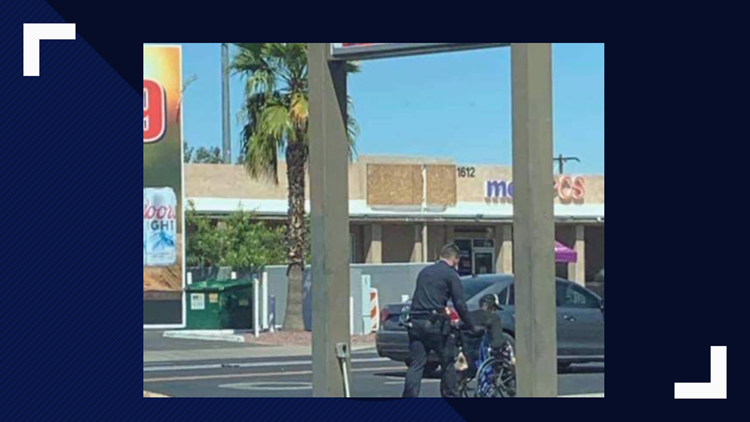 "This photo is a true example of a Phoenix police officer serving the community as our officers do each and every day."